Welcome to the next edition of our marine itineraries. 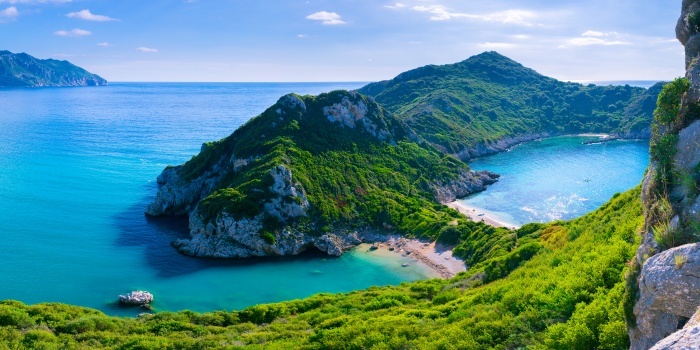 We hope you enjoy reading these, and are eager to share with you even more suggestions about the places you definitely need to visit when chartering a yacht in Greece. This time we chose Mykonos as our departure point. 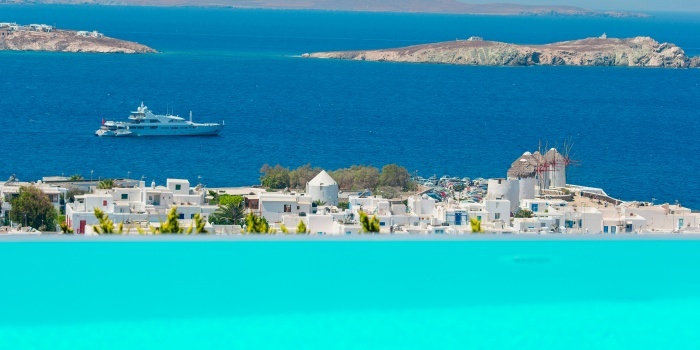 Being one of the most popular Greek tourist destinations, Mykonos has also been gaining praise as a marine destination. We at CharterClick like to call this a Windy Route, due to the strong possibility of facing strong winds along your way - so be prepared in advance. And without further ado, let’s start our journey, shall we? Yes, we know that Mykonos has been on the rise lately, and it will be a shame not to explore it before starting your trip. But don’t you worry - we’ll come back here later, so we can see this place in full. So kick back, relax, and set sail south, towards Delos. We recommend to leave Mykonos very early in the morning, so you can drop the anchor near Delos, and have a little swim in the blue waters here. If you leave even earlier, you might have a chance to go to the mainland, and visit some ancient ruins, that are very well preserved here. 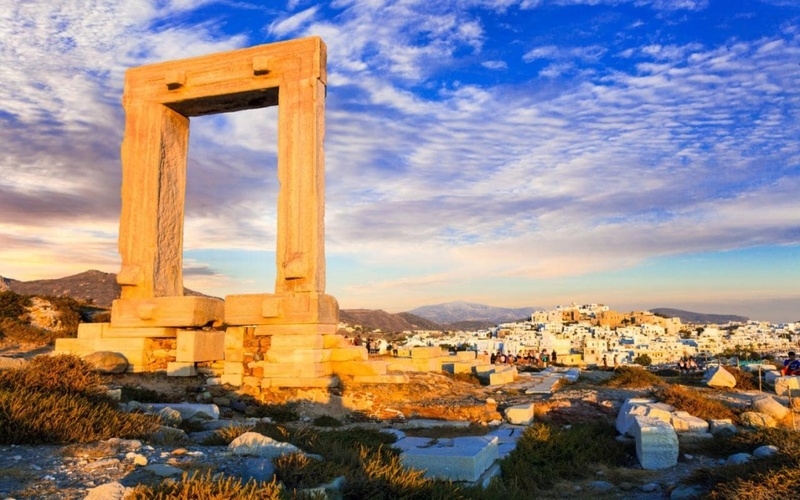 Naxos is about 23 miles from Mykonos, and you can’t really miss it - long before you see anything else, you’ll spot a famous Portara arch, that is the entrance to the unfinished Apollo temple. Raise your sight up, and you will see a beautiful Venetian castle, standing right above you on the hill - seeing this place is a must since you are already here. Once you are done exploring, treat yourself with a nice dinner in one of the local restaurants, that would definitely surprise you with something fresh and unexpected. 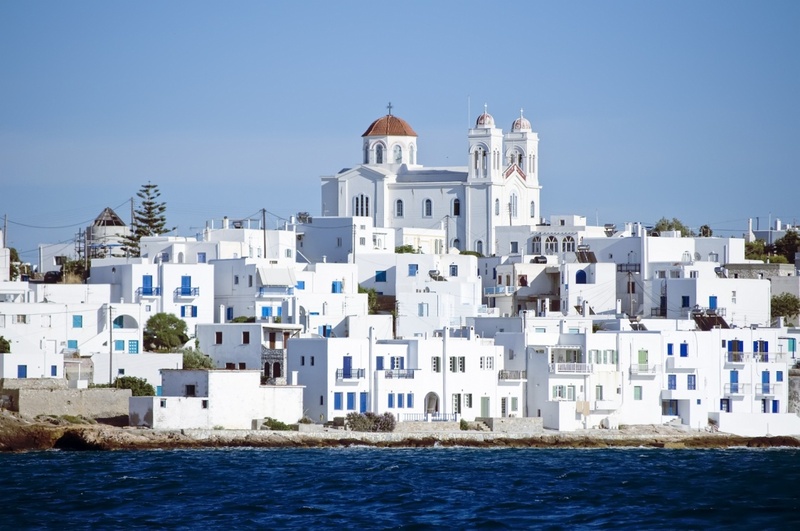 You might remember Paros from our previous itinerary - that one island with perfect whitewashed houses. And here we are back again - even if it is your second visit, it’s definitely worth to give this place another round. As we mentioned before, it’s pretty hard to find a more picturesque place in Greece. Remember all those picture perfect postcards you were inspired by? Well, chances are that those photos were taken here, because local sights are truly marvelous. Just unwind, relax, and enjoy your ongoing vacation, while inhaling the true spirit of Greece and exploring this beautiful town. You are on vacation after all! Get ready for your longest sailing distance yet - you are about to glide 35 nautical miles to Serifos. 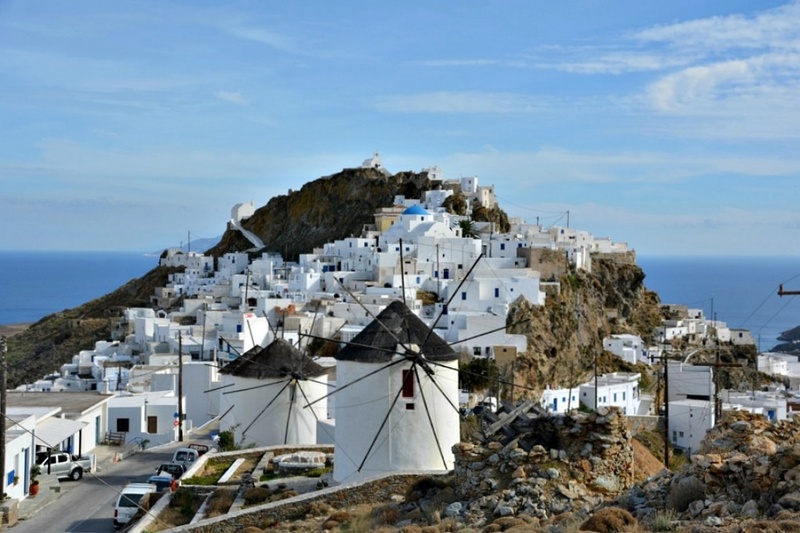 If you are after true and untouched authenticity, than you are in luck - Serifos is not considered to be that popular among tourist community, and retains a big part of its personality to these very days. This is another island covered with whitewashed houses, but this time they are mushroomed across the hill, which looks quite surreal when you first get a chance to see it. Be prepared for a tough walk though - exploring this town almost certainly means going uphill, and any kind of heels is not an option here. You can always take a cab, although exploring by yourself would definitely be more exciting, even if harder. There’s no way you’ll end up not taking a single pic for your vacation memories - releasing a shutter here is, basically, compulsory, and happens automatically. And with vistas like these, we totally understand why. 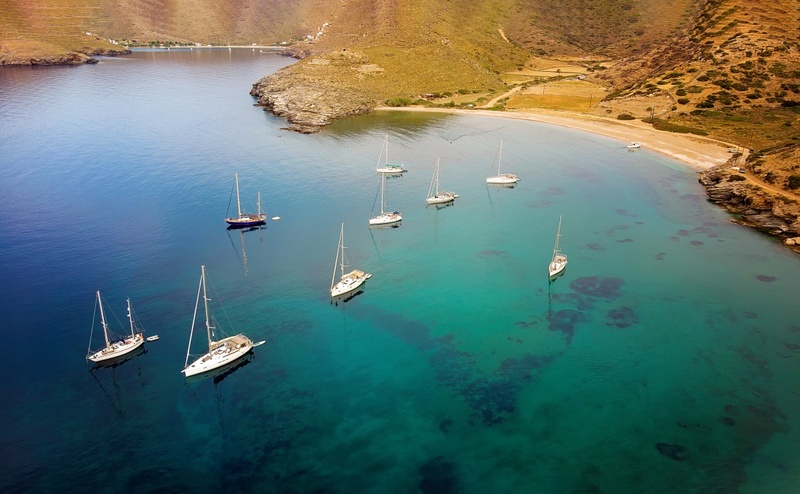 Prepare to sail another 21 miles towards Sand Bar Bay harbour at Fikhiada, located on Kithnos. This is the ideal spot to relax on the beach, and just spend a lazy day ashore. Dine in the nearby cafe, visit the local bar, or just go shopping for some souvenirs, so you can keep the memory of visiting this beautiful place forever. Just be prepared to face tourist crowds - summers get pretty busy here, and you might end up standing in a queue line quite often. You’ve been warned. 20 miles east is Syros - another white and blue canvas of a town. But blue roofs and green vines are not the only things this place is famous for - bread and family bakeries are another things locals are very proud of. 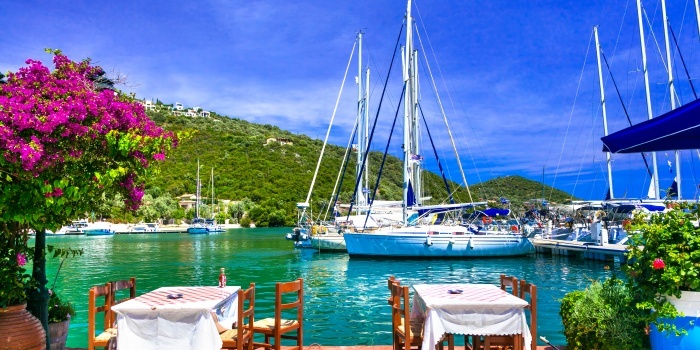 Just imagine having lunch with a freshly baked bread on your table, while admiring those famous Greek sights - that’s what we call a real vacation. 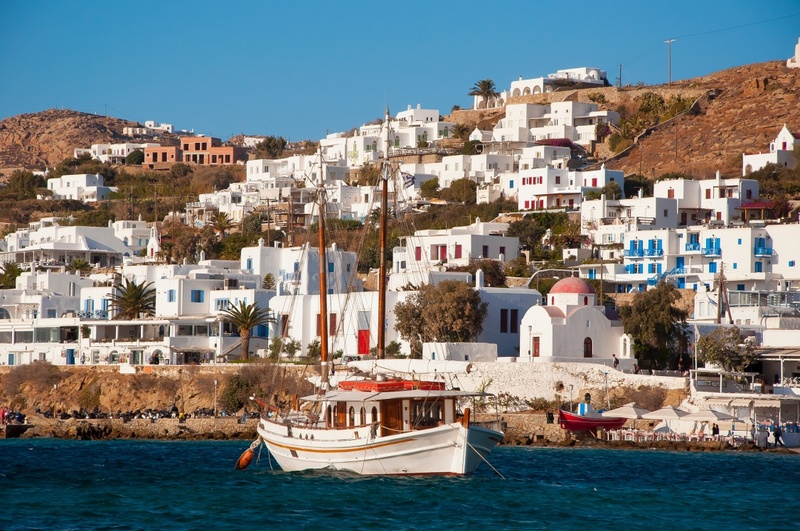 You might also want to visit Ermoupolis - the capital of Cyclades. It is its busiest city as well, so expect pretty crowded public places, along with big tourist groups all around the city. Well, you have two choices here - either stay one more day in Syros and enjoy local cuisine, or set sail back to your final destination in Mykonos, and spend a couple of days there. The choice is, obviously, yours, but there’s really no right or wrong decisions here - both destinations are more than beautiful, and deserve far more than two days of exploration. But in case you’d like to arrive back to Mykonos early, you’ll find plenty of stuff to do there. Recently, it welcomed lots and lots of new establishments to the island, including famous restaurants, hotels and night clubs. Speaking of night clubs - local joints are often hosting worldwide celebrities (think Steve Aoki and Zedd), and some celebrities are even thinking about opening their own night clubs on the island. So if you are looking for the most vibrant nightlife in the region, than you’d definitely need to arrive early. Stay tuned for our future updates - we still have plenty of destinations and thrills to share. Until next time.